This is very much a 'back to the future' kind of game in that I originally fought this action way back in December 2012. I was itching to get some figures on a table since recently acquiring the Middle Eastern WW1 collection before I started the great rebasing. I am slightly restricted at present in that the only Hexon terrain I own is the standard verdant green which is not hugely suitable for the actions set in Palestine or the Arabian Peninsula. 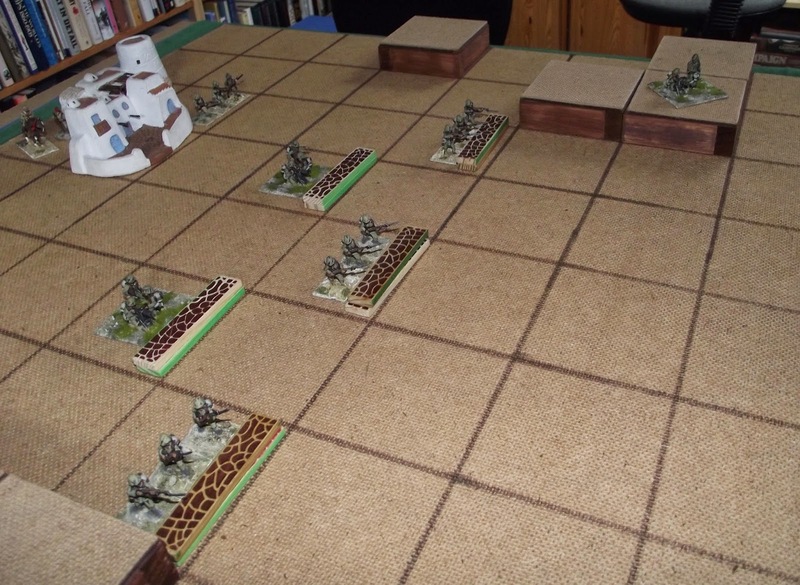 I shall be acquiring a desert set of Hexon in a couple of weeks but for time being decided to make do with my square gridded Portable Wargame board. I had a quick flick through the actions I have fought using this board and came across my very small refight of the charge of the Australian Light Horse at Beersheba in 1917. 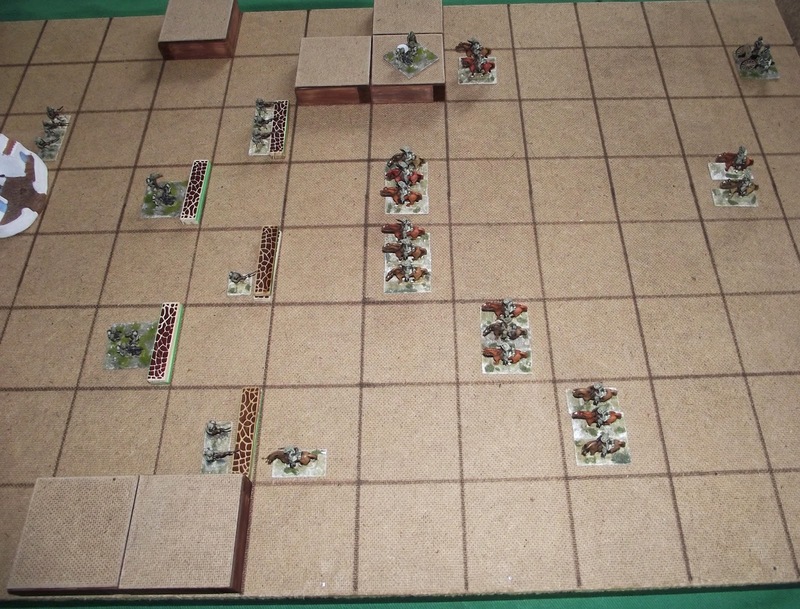 I originally fought this action using my block armies and Bob Cordery's Portable Wargame rules but decided instead to make use of his Memoir of Battle set with some tweaking for the square as opposed to hexed grid. The opposing forces and the initial dispositions are the same as the original action - the only difference are the rules in use and the fact that for the first time I am using figures rather than blocks. The Light Horse deployed for the attack on Beersheba with the supporting artillery on their right flank. the command are with the guns and only a single unit is deployed as a reserve. The Turkish defences. The trenches are plentiful and well sited but crucially are relatively lightly held. A machine gun is deployed on the hill on the left flank and three of the four units of infantry are in the forward positions. The reserve, in Beersheba itself, consists of a single infantry unit and the command post. Another view of the first line of the Turkish defences. Note the two machine gun positions. The Australians advance into the attack. The extreme right flank unit is refused slightly in readiness to attack the Turkish position on the hill. The supporting artillery fire has thus far been ineffective. 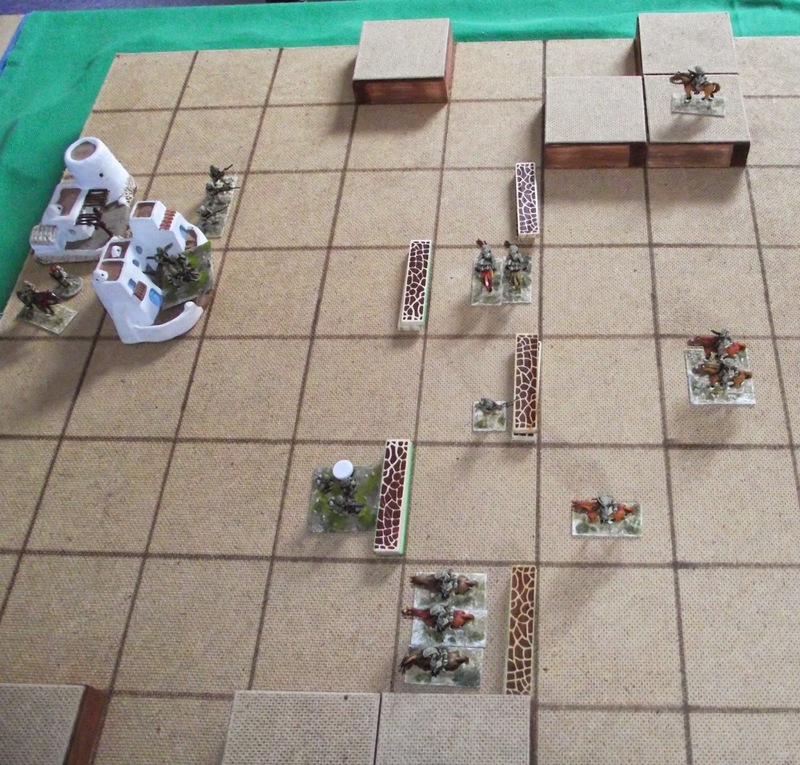 With the thunder of hooves the Australians charge into the attack. The attack on the hill machine gun swings first one way and then the other as the Turks desperately attempt to hold off the marauding horsemen. Meanwhile the first trench lines are attacked with damaging losses on both sides. The Turks in the centre succeed in driving back the horsemen but at a heavy cost. 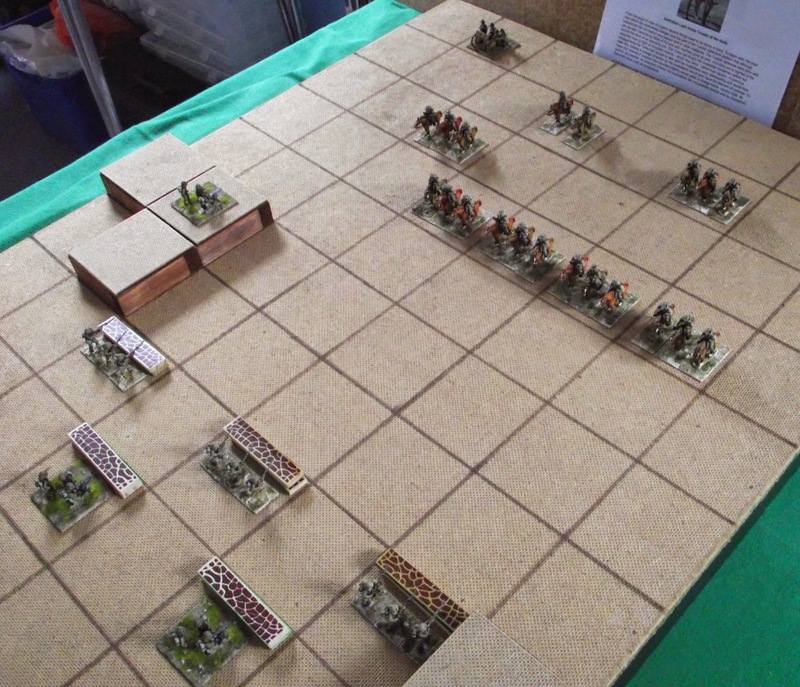 The trench at the foot of the picture sees some vicious close range fighting with neither side making any headway. Finally, after committing their reserve the Light Horse break through. The machine gun on the hill is finally overrun and the central weapon beats a hasty retreat back into Beersheba itself. Aside from isolated resistance the Australians sweep into the forward positions driving the remaining Turks before them. Those that were too slow to escape were mercilessly cut down. Seeing that his defences had been destroyed the Turkish commander orders his men to surrender to avoid further bloodshed. The Light Horse had carried the day. The surviving horsemen with their commander. It was a spectacular victory but at a far heavier cost than expected. Nearly half of the Australians had been laid low but the Turkish commander was quite unnerved by what he had seen and had no desire to be ridden down with the rest of command. The game played out with far more decisiveness than the first time and once the Australians had breached the front line the Turks literally had nowhere to run to. 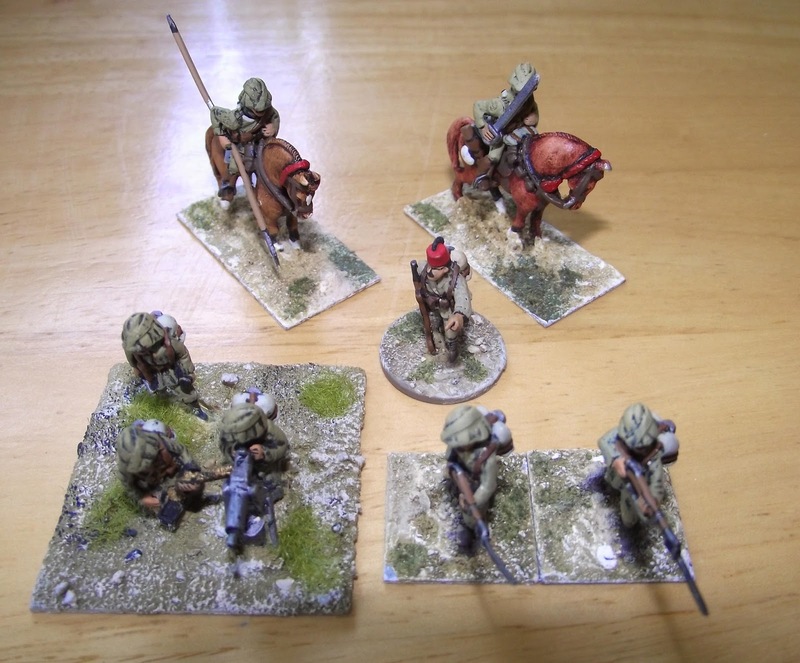 Using figures made a real difference to the feel of the affair and so I am looking forward to getting my desert Hexon tiles and rebasing the collection to fit in with it. I was rather pleased with the buildings I used and they did not seem at all out of place in the overall scheme of things despite being quite small. I am especially looking forward to using the multiple figure bases for strength points as the units look more substantial. As it stands an infantry unit will have four bases each of two figures whilst mounted will have three bases each of two figures. The coming Autumn and Winter are promising to be really interesting from a gaming perspective! I suppose I should not be surprised really seeing as how myself and self-imposed deadlines are usually not the best of friends. It is now unlikely that I will have all the ships for the first phase of my 1/2400th scale WW1 project completed by the end of the month but the only thing that will be outstanding will be the destroyers - and I take a degree of solace (should that be a quantum?) from the fact that are already based and undercoated. The remaining German capital ships are now well over halfway finished and will be completed over the weekend. As mentioned previously these consist of an additional Kaiser class battleship, Seydlitz, Von der Tann and a brace of Moltke class battlecruisers. Once these are finished I will have the last eight RN types to attend to before tackling the destroyers. As far as rules go I am still pondering a number of options but not with any great conviction - the first priority must be to get the models finished and then I can worry about how I am going to game with them. Incidentally, I have managed to break with my original plan of using one model to represent two actual ships (for the capital ships) a la Paul Hague in the case of the battlecruisers. My reasoning is simple - as the forces were relatively small having each of the major participants represented made more sense should I want to attempt any historical scenario type games. Besides, I have some very fond memories of using the German First Scouting group of 5 battlecruisers during umpteen games of Jutland! Return to the Roghan Valley? There are some pretty good 20mm figures that would be suitable for this - I am thinking more about the tribesmen at this point - so cobbling together a reasonable force would not be too difficult. I would need to add to the Indian part of the collection somewhat (cavalry and perhaps more infantry) but I think this would be quite doable in time. One to ponder for the future but now I must get back to the ships! 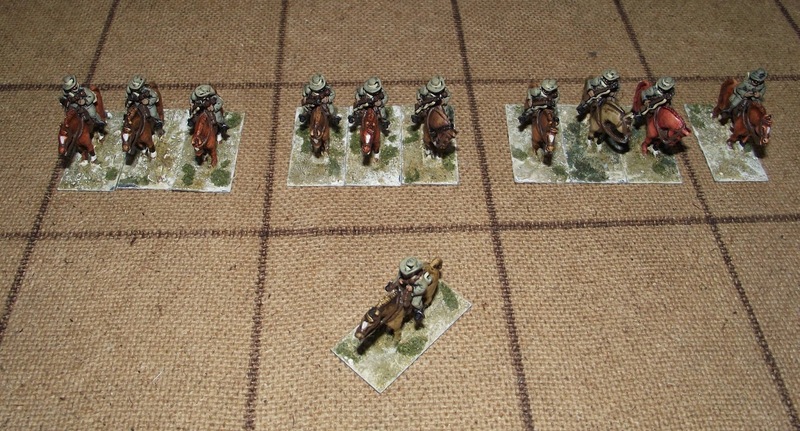 Imperial mounted troops - from left to right I have 8, 20 and 8 plus an officer and a bugler. 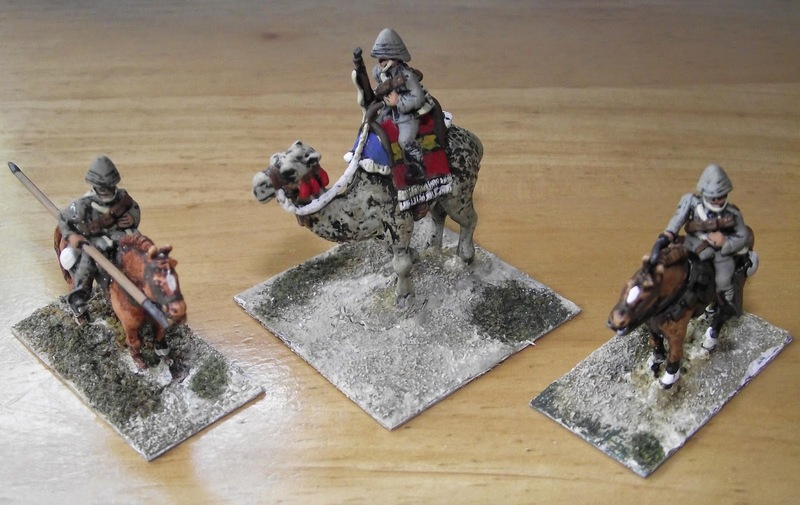 Note the chipping on the bases and the truly huge 40 mm square for the camel corps (and I am not sure about the camel furniture but it looks really nice!)! This is a staggering collection in anybodies language but there are a few minor problems to be overcome. To begin with, roughly 60 percent of the collection is painted to a professional standard with the quality of the others ranging from a good gaming standard downwards. Now you could say that I am a fine one to talk having purchased the entire thing ready painted but the difference in quality is quite noticeable. I have a plan to help with this though. I shall be rebasing the entire collection - this will be a mammoth task for sure - so that it looks more uniform. The models at present are mostly on galvanised steel which is OK but it makes for a very thin base. I prefer mine with a little more depth as I routinely pick figures up by the base rather than touching the model so this is an important consideration as far as I ma concerned. The figures are currently on 20 or 40 mm frontage which I will stick to although for reasons that will become clear in time I will be looking to base the figures in multiples - probably 2 foot on a 40 by 20 or 2 mounted on a 40 mm square. 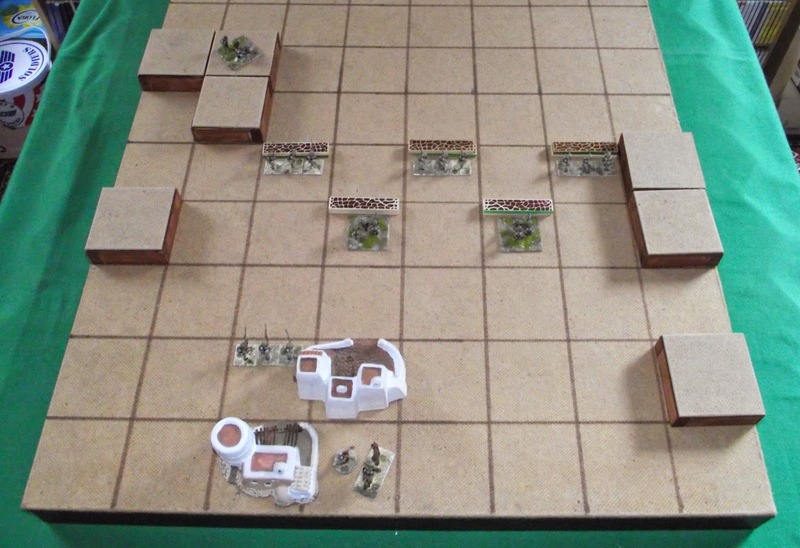 I will having infantry units consisting of 4 bases and mounted of 3 - each base having two models on it. This has been designed around using Hexon tiles which will accommodate the units in the sizes described. The ANZACs. The Lighthorseman at the top of the picture has some 20 companions and there are 102 foot figures with the two machine guns. The Turks - and there rather a lot of them. There are two types of cavalry and the gentleman sporting the red fez is the only such attired figure in the collection. He makes a great NCO though! The troops of the Asia Korps. German infantry, artillery and machine guns used to bolster the Turks in Palestine. Of the entire collection I would say that the Imperial infantry needs the most work. The Indian troops are fine but are not painted to the same style as the machine gun crew but I reckon this could be easily corrected. As you can see the bases have taken a bit of a bashing over the years but that could be easily rectified. the difficulty will be getting the models off the bases but I will give that some thought in due course. I shall be aiming to get the rebasing finished for the first part of the collection by September so that I will be able to commence gaming with them during the autumn. Conspicuous by their absence are the 30 mounted Arabs - 15 on horse and 15 on camels. This is due to them being pretty grim looking and I am planning on repainting these at the earliest opportunity. The month of May was a very good one for me from a work perspective. As you may (or may not) know I am currently working within financial services recruitment and was delighted to have placed two and a quarter people (the quarter was my share from helping someone else with a particularly tricky role) in new positions - by that I mean jobs. The end result of all this was that my sales billing target for the month was smashed by a record-breaking margin. Anybody that works in a sales environment will be aware of the use of incentive schemes whereby when certain thresholds above your target are reached prizes are given out to a stipulated value. By virtue of my successful month I qualified for the top prize; specifically the cash equivalent. I mention all this because it does have a direct bearing on this post as we (SWMBO and I) decided that whilst the main bulk of the prize monies (and this is separate and in addition to the commission earned) would be used for our forthcoming holiday a portion could be used by me for whatever I wanted in reconition of the amount of hard work I have put in. Naturally gaming bits and pieces figured prominently but I was also toying with the notion of acquiring a tablet to support my mobile computer needs. Then it happened - an 'Oooh shiny' moment of such earth-shattering, buying the winning lottery ticket, 'watcher-in-the-skies-when-a-new-planet-appears' proportions that everything in my gaming universe was been turned on its head. As an aside this will also the reason I will be missing Broadside. So what exactly has caused this great conundrum? A taster of what is to come - and boy oh boy I am delighted with this little lot! 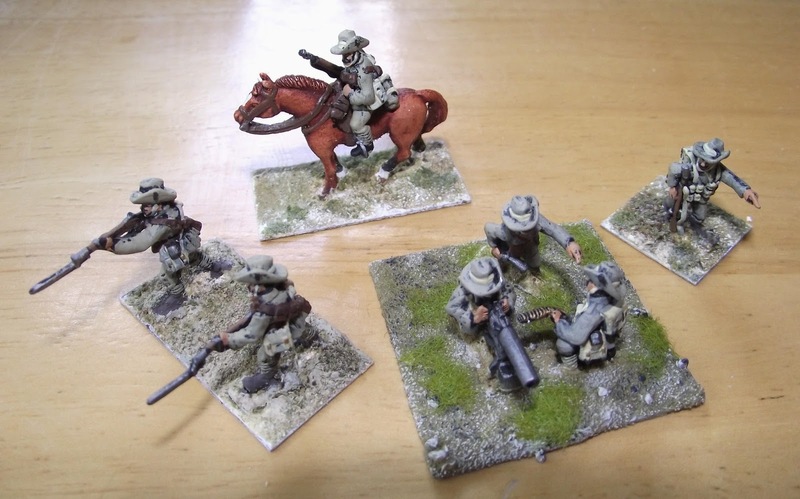 Essentially I have acquired a previously owned 3/4 professionally painted metal 20mm WW1 Middle Eastern collection consisting of horse, camels, foot, guns, machine guns, limbers, wagons, command, armoured cars and pack mules. There is nigh on 700 models in this collection - Tumbling Dice for the most part, with some Dixon draft horses used with the wagons - and are mostly (the 3/4 mentioned above) professionally painted in a early Dallimore style (black lining and bold shading) complete with textured bases. The figures are based for storage in six box files, all lined with magnetic paper so the entire collection stays in place when on the move. The figures are primarily based individually with machine guns and artillery on larger bases. Some of the earlier units are on multiple bases whilst the camelry are on massive bases which will certainly need changing. 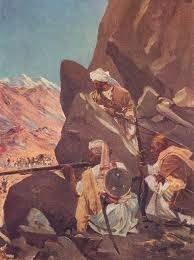 The forces represented are the Turks, Germans, Imperial, Indian and Australian with some camel and horse mounted Arabs. I will be holding a photo shoot of each force in due course. The significance of this collection for me is that in one fell swoop I shall be able to tackle all those games that had only existed in my imagination or had been fought using the blocks. If I am completely honest the likelihood of me ever acquiring a such collection using conventional methods - that is buying the bare metal and painting the same - is extremely unlikely and probably impossible. Having said that, there are a couple of units that will be repainted by yours truly - the Arabs and Indians to begin with. To say that I am delighted with this collection would be putting it mildly. I now have the wargaming wherewithal to undertake not only one off battles in a period I am passionately interested in but also to realise, at long last, all those ideas kicking around for campaign ideas. The models in the collection are probably around 30 years old and as a result there is a degree of routine maintenance required. the biggest issue is around the basing as some of the models are not based as per the bulk of the collection so some degree of rationalisation will be required. Some of the models will need to be rebased completely which will have the knock on effect of meaning that everything will need to be painted in a uniform fashion. I am not fussed by this, in fact it will help to tie in those models that are not painted in the main style. 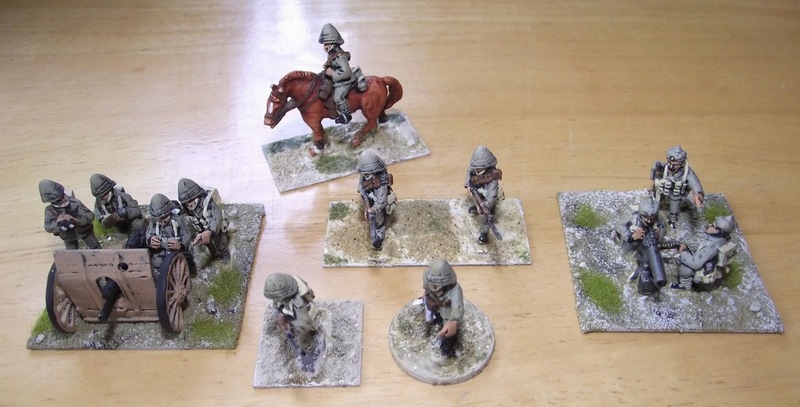 I often find that a uniform basing style can help units to blend in - even when they are painted using different techniques. The current frenzy of warship painting will continue unabated with the only change being to the long term plan in respect of ship acquisitions. For reasons that will become obvious I will need to add some of the older kit to the two fleets - protected and armoured cruisers and pre-dreadnought battleships mainly - as the theatre the Middle Eastern collection will be used in will feature much in the way naval activity. It may have been Confucius that said something about 'May you live in interesting times' - mine have certainly gotten a whole lot more so! The last of the German capital ships for the WW1 1/2400th scale are currently under the brush and I am planning on having these completed for Saturday. Sunday will then see me tackling the last of the Royal Navy for the current phase. Between the two sides there are 12 ships to paint with the 13th being the Goeben for the Turks. Panzerschiffe produce a number of models for the Turkish navy so I shall be adding these with my next order - possibly with some Black Sea Russians. In the fullness of time I will tackle some of the Mediterranean navies but there is no hurry at present. The big news though is that due to a rather happy circumstance - which I shall unveil on Sunday - I will not be attending Broadside this year. 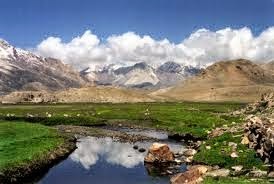 I am really disappointed by this but the reason I am missing it will more than make up for it. I managed to finish the latest batch of RN capital ships over the weekend and also managed to make a start on the final batch of capital ships for this phase of the WW1 1/2400th collection. The models are of a missing battle cruiser - H.M.S. Queen Mary - and a further six ships from three further classes. An unmodified H.M.S. Queen Mary - the centre funnel is untouched and she does not have a stern walk either. My conversion from the original Lion casting was not a great success! Two of the Orion class - the first of the 13.5" armed battleships. This was least favourite casting from the Stonewall range due to the rear facing tripod around the fore funnel being horribly moulded. I had to remove it for this reason and it was a fairly tricky undertaking to do so. A profile shot of the lead ship of the class. Two of the R class battleships armed with eight 15" guns. These were intended as a cheaper version of the Queen Elizabeth class but were slightly better in terms of the armour layout. However, they were designed with coal fuel in mind and were only capable of around 21 knots meaning they were designed solely to operate with the battle fleet. H.M.S. Revenge. This is not a bad casting but it did need a lot of cleaning up. The magnificent Queen Elizabeth class. These were designed as fast battleships to support the battle cruisers and with eight 15" guns were able to lend critical supporting fire to Beatty's battle cruisers at Jutland. The class went on to serve with distinction during WW2 where H.M.S. Barham was sunk by submarine in the Mediterranean. H.M.S. Warspite. I think it is safe to say that the Royal Navy and the tax payer certainly got their monies worth from this particular battleship although the view of her crew when circling out of control in front of the High Seas Fleet at Jutland may not have been quite so rosy! The recent arrival of the twelve models from Panzerschiffe means that I am now very close to completing the dreadnought phase of the collection. I have some 5 German and 8 RN vessels based and undercoated with the Germans being tackled first of all. I am aiming to have these finished by the weekend so that I can then start the last of the RN ships. There are of course still the 56 destroyers to tackle and the clock is ticking!